Ann Taylor Classic Black Leather Loafers. Size 9,5 M. See photos for details and condition. 1 1/4" heel; 3/4" platform. Leather upper/synthetic lining and sole. Excellent pre-owned condition. Missing insoles. 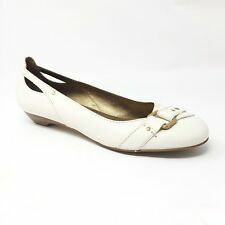 Pretty Franco Sarto Size 9.5 M Ivory Cream Leather Flats Shoes with Gold Buckle And Cutout details reminiscent of the D’Orsay style. Not a true flat since it has a bit of a wood look heel. I believe the upper is leather, but there are no material markings. Good pre-owned condition with some marks and scuffs consistent with normal wear (especially above right heel) so please see all photos. Lining of shoes has a few nicks as well, shown in detail photos. This is the Olympia, from Pothia, a mary jane leather flat with an orthotic footbed and slip-resistant outsoles. They are in excellent condition, with no noticeable wear on the outsoles. The insoles also show no wear, and are perfectly clean. Upper: Leather. Removable comfort foam insole. Heel Height: 1 1/4". Item# 2067. "Tock" is made in Brazil. Padded leather insole; leather lining. 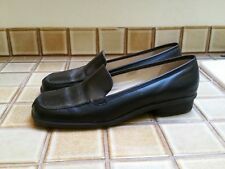 MUNRO Women's 9 1/2 American Traveler Black Stretch Block Heel Loafer Bootie Shoes....very nice pre loved condition. Nice pair of slides. Light wear on soles. Great pre owned condition. A couple of scratches on the front. Material: Leather (Lambskin). Designer: Chanel. Exterior : Very Good, wrinkling on leather throughout both ballet flats. A few small scuffs at toes and corners. (See photos). Heel Height: 0.5”. Excellent condition! Soft sole comfort, hand lasted moccasin, soft leather construction. J.J ill New Orange Leather Women Flat shoes. Sz-9.5M. China. Sz-9.5M. China. Upper Leather. Lining And Sock;Leather. Outer Sole;Leather. No holes or stains. Mark on toe of one shoe - pointed out in picture. BLACK FULL GRAIN LEATHER UPPERS. Make Supersized Seem Small. Get Images that. KEEP LOOKING! Grey Buckled Strap Buckle Shoes Wedge. This is a Ladies' Hush Puppies Footwear. It is a size 9.5 M.
These Clarks shoes are in great shape! Technology Unstructured. Upper Material Leather. Lining Material Leather. Alegria Feliz FEL-101 Black Shiny Leather Mary Jane Shoes Size 9.5 EUR 40 EUC!! Alegria Feliz FEL-101 Black Shiny Leather Mary Jane Shoes Size 9.5 EUR 40 EUC!!. Condition is Pre-owned. Shipped with USPS Priority Mail. Nursing, work, comfort shoes! Allegria, Alegria by PG Lite THESE HAVE ONLY BEEN WORN ONCE OR TWICE! $140 retail! EUC! See photos for detail! Feel free to ask questions! Fast shipping!! Smoke free home! Happy Shopping!! They are black. They are size 9.5 M.
MERRELL Women's Size 9.5 Shoes Brown Suede Leather Mary Jane 'Plaza Bandeau' Preowned. Top of left shoe has some spots. Otherwise in good condition. Please see photos for complete description. They are black leather, and a size 9.5M. I will decline them. Brown Causal Comfort Shoes. Suede and Nylon. Excellent - Only slight signs of wear. Does not diminish the overall appearance of the item. Red top stitching. Leather micro suede. Buckle & strap accent. 1" block heel. Good - Shows signs of regular use. All leather. Style J004. Made in Italy. These previously owned and worn shoes have scuffs, creases, marks and wear on the sole. COLOR: antique ivory off-white. Slip-On Work Nurse. EU 40 US 9.5/10. Don't like them?. Send them back! These burgundy leather penny loafers are by SAS in size 9.5S, Narrow. Removable insoles=no. These shoes are in very good pre-owned condition. Cushioned insoles. Made in the U.S.A.
Genuine Attilio Giusti Leombruni EU Size 40.5: Runs SMALL, fits like a 9.5 or a loose 9 10-3/8" Long Inside; 3.5" Widest at Sole Good Pre-Owned Condition: Overall in very good, clean condition. Have some minor scuffs and marks to leather uppers, wear to finish/color on heel cup of one shoe, as well as minor wear to interior leather lining and soles; no major damages. Please check the detailed photos! .